It's a Christmas Flag so I would only hang it out at the Holidays! I waited until the last minute to find a Christmas Flag in the stores......so that day I received a Miles Kimball catolog, and there it was! Ordered it and it came before the holidays were over......so got to hang it! I really do love your stuff! I have always ordered what ever I needed from Miles Kimball! Thank You! I collect Snowmen. And I have a lot of cardinals in my Christmas Décor. So this seemed perfect. It is wonderfully colorful and looks like it will last for many years! I will use this snowman flag all winter. He is cute and cheerful. Perfect for my front door! It was easy to put a dowel rod through the pocket and hanging cord, tied to each end of the rod! This looks so cute, for winter time door decor! Adds nice homey feel to our front yard. Looks very festive in my garden. A little small, but adorable. Put out in front of our property. Cute, colorful and stands out. 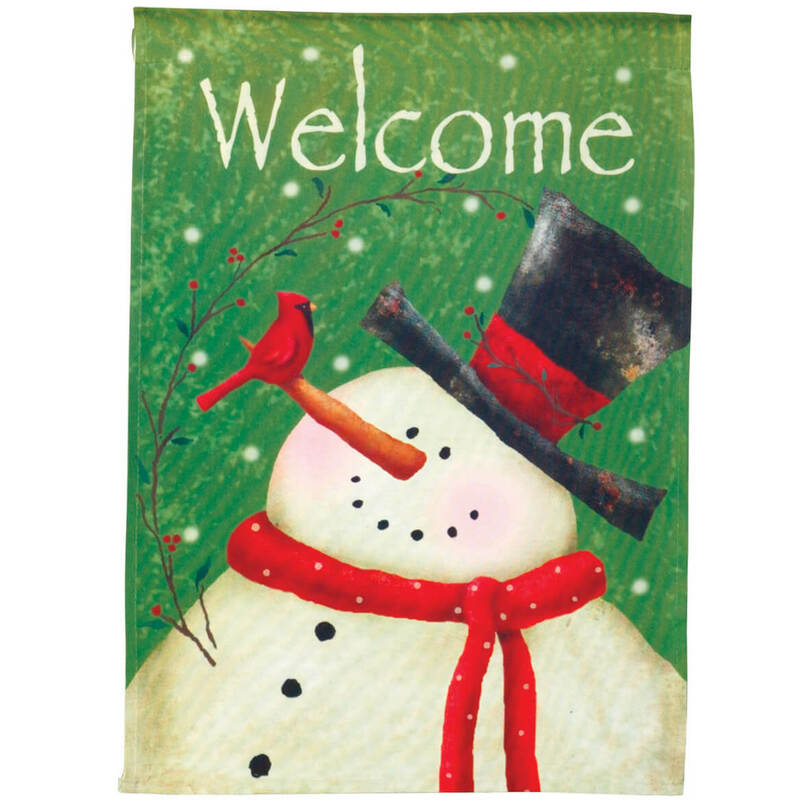 The snowman garden flag is adorable it's cute it's perfect! Use the small flags in my yard year round. LITTLE SMALLER THAN I LIKE. BUT GET WHAT YOU PAY FOR. Love the subject matter. Would have loved more if it had been two sided, but it still works. Wasn't wild about this flag. For the price expected the print to be on both sides. I thought the flag was a lovely print, but I was disapointed that the print is just on one side, the back side is white. First time I have ever bought one that did not have the print on both sides. Flag is only printed on one side. This should be noted in the description. But then I guess they wouldn't sell any!!!! He's cute and I also love cardinals. Because it is a flag that can be used all winter. Also, there was a cardinal on the flag and my mom, who is no longer with us, used to love cardinals so it made me think of her. Cute design and the place I'm putting it doesn't matter that it is only one sided. And it was on sale with free shipping. Wish you would eliminate the handling charge. xmas gifts for my wife out of catalog and she picked them. I wanted to hang this outside my door to welcome my guests. Love the bright colors, snowman & cardinal. Loved the face of the snowman and the cardinal on his nose. I needed something to spruce up my yard this flag is perfect! I like snowmen. Nice face. lIKE THE PICTURE AND I ALWAYS HAVE A FLAG IN OUR FRONT GARDEN. As the winter flag pole decoration. I collect cardinals and got new flag holder for Xmas - needed a winter flag and this was perfect. I recently moved into a home and have always admired the garden flags. This one appealed to my snowman love and it is colorful. For my front flower bed - January. I'm giving a snowman themed party. It is said that Cardinals appear when angels are near, my sisters & I always get something for each other at Christmas with a Cardinal on it in remembrance of our dad. Enjoy flags for the yard. Nice size to hang on my side door. Snowmen and cardinals are two beautiful expressions of the Christmas spirit! I need a replacement snowman flag. The other one I currently have is faded. Needed a new Christmas Flag.......Perfect!! I love snowmen & especially love red birds. It's a Christmas flag. Why not? Very unique and great prices. I have two mini-flag poles so I bought two flags, which also reduced the price of each! Since the back is plain white - could I buy 2 and sew them together? BEST ANSWER: I would think that would work just fine. Only problem I can see would be the casing to hang it by. You will probaly need to use just one of those and sew the second flag right below that seam. I have 2 garden flag hangers and put this one in a spot against my home so it doesn't matter that the back is white. Good luck. Sounds like a wonderful idea; yes, I'm pretty sure this would look great! I would think you could. Are the all garden flags just printed on one side? BEST ANSWER: This snowman flag is only printed on one side. It holds up very well in the outside weather. The colors are still very bright just like the day I received it. this flag is printed only on one side. Have not yet recd Snowman Garden Flag???? BEST ANSWER: Thank you for your question. Unfortunately the Snowman Garden Flag has sold out. We no longer have inventory and are not expecting further shipments from the supplier. We hope this information will be of help to you.